Everyone wants to keep their turkey nice and moist at Thanksgiving. The problem with a whole turkey is that the dark meat takes longer to cook than the white meat, and the white meat can dry out easily after a long time in the oven. 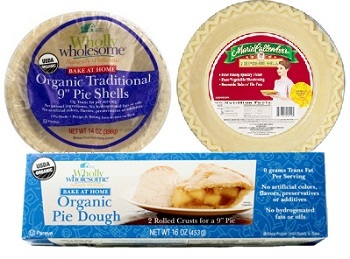 There are all kinds of methods out there that promise to deliver a flavorful turkey with moist, tender breast meat. The High Heat Turkey Method is usually my go-to way to cook a turkey, since it produces a really beautiful bird with great skin (especially if you coat the skin with butter before putting it in the oven) that is still nice and moist. But this year, I tried Thomas Keller’s Mayonnaise-Roasted Turkey Breast recipe a few times with great results, so I decided to use technique with a full sized bird and make a Mayonnaise Roast Turkey. The mayonnaise turkey breast is made by coating a large turkey breast in a thick layer of mayonnaise, which sort of bastes the breast in oil as it roasts in the oven and keeps all that white meat nice and juicy. 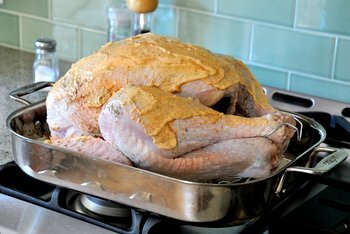 For a larger bird, the technique is very similar: a layer of mayonnaise is applied to the turkey before it goes into the oven and gives you an easy way to infuse that turkey with some extra moisture. Cook’s Country also featured this method in their magazine recently, and I ended up combining the methods for one that worked out just right. First, cover the turkey with a dry spice rub so that the mayonnaise has something to adhere to when you smear it onto the bird. Then, season the mayonnaise and rub half of it onto the turkey. The turkey is first cooked at a relative low temperature to start it off, then another coating of mayonnaise is added and the temperature is raised to finish off the cooking and give the turkey a nice, dark finish. The resulting bird excellent. The white meat was very, very juicy and the seasoned mayonnaise gave the skin a nice flavor, though it didn’t produce as crisp of a skin as the high heat turkey method does. 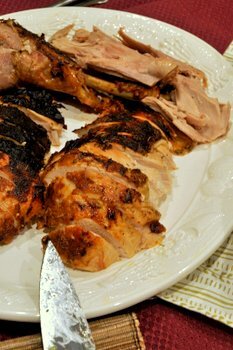 The dark meat was also moist and flavorful, and I had no worries about the turkey drying out as the dark meat cooked. Since the last portion of the cooking is done at a high heat, this method also gives you a pretty clear timeline as to when your bird is close to being done, which helps with the timing of side dishes. 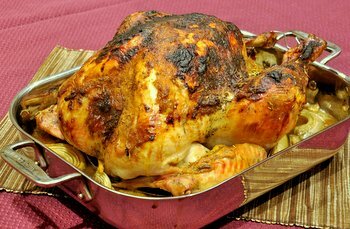 I used a 14 pound fresh turkey for this recipe, but it can be adapted to any size bird. If you have a very large turkey, you may need a little bit more mayonnaise in your recipe. Take your time defrosting a frozen turkey and make sure it has defrosted completely before using it. Whether you are using a fresh turkey or a frozen one, make sure to leave the turkey at room temperature for about an hour before cooking it to help it to cook more evenly. Homemade mayonnaise is going to give you excellent results, but a store-bought mayonnaise will work well, too. You can get away with using a “light mayonnaise,” but don’t try to make fat-free mayo work for a recipe like this one. And, finally, use a meat thermometer to check the dark meat of your turkey for doneness. The dark meat takes longer to cook and, since your breast will be nice and moist, you only really have to worry about the dark meat coming to the correct temperature. Meat thermometers are reliable and will take the mystery out of roasting the bird. Thoroughly rinse turkey inside and out, and remove any giblets, etc. that may be inside the cavity. Pat turkey dry very thoroughly with paper towels. Place on a rack in a large roasting pan and allow to air dry for 45 minutes. In a medium bowl, stir together garlic powder, salt, pepper, paprika, sage and rosemary. Sprinkle half of the spice rub evenly over the turkey and then rub it in to the skin of the bird. Add mayonnaise, olive oil and cider vinegar to the remaining spice mixture and whisk thoroughly. Use a spatula to spread half of the mayonnaise mixture over the turkey. Cover the breast area loosely with a large piece of aluminum foil and put the bird in the oven. Roast turkey for about 3 to 3 1/2 hours for a 14 pound turkey (see note below for other weights), until the dark meat registers between 140 and 150F. Take turkey out of the oven and remove the aluminum foil. Use a spatula to spread the remaining mayonnaise mixture over the bird and return it to the oven. Bake turkey for an additional 40-50 minutes, or until the dark meat reaches a temperature of 175F (white meat should be 160F when done). Allow turkey to rest at room temperature for 30 minutes to allow the juices to redistribute before slicing. *Note: I used a 14 lb turkey for this recipe. You can use any size turkey. The standard wisdom for roasting turkeys is 15 minutes at 325F per pound, so if you have a large turkey, you will need more cooking time. Therefore, a 16-lb turkey should need about 30 more minutes in the oven at the lower temperature. A 12-lb turkey should need 30 minutes less. Use a meat thermometer in the dark meat of your turkey to ensure that you have the right temperature for best results. I’ve been doing mayo on my Thanksgiving turkey for years now. When my kids were little but old enough not to try and lick the mayo off their hands they would “help” shmear the mayo over and inside the bird. Funny. I happen to be in L.A. tonight (I waved to you) and this woman and I were talking this method of making the turkey just tonight. And boom, here it is! Can you still use the drippings for gravy, or are they too mayonnaisse-y? 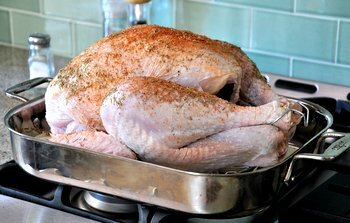 The only thing that i’m a bit leery of in this recipe is part where it says that after, you remove the innards bag & wash & dry the turkey, your supposed to let it sit in the sink at room temp for 1 hr supposedly for more even cooking, but what about the potential for salmonella & listeria plus the fact that I live in a tropical climate with high humidity wouldn’t be much safer to let it sit in the refrig for 1 hr before seasoning & baking? Monica – The washed turkey is supposed to sit in the roasting pan to “air dry” not in the sink. This is a step recommended by Cook’s Country to help ensure that the turkey is dry (so that the mayonnaise layer will stick to it) and at room temperature, since many people tend to pull their bird out of the fridge, feel the skin and decide that it is at room temperature after 15 minutes. A room temperature turkey, like any meat, will cook more evenly than one that is cold throughout. If, however, you live in a climate that keeps you from feeling comfortable with that it is not a mandatory step. Just dry it thoroughly with paper towels and skip the air drying. Sue – The drippings make great gravy! They’re not mayonnaise-y at all (I worried about that, too) and the gravy made with them has tons of flavor. Will try this on my turkey breast next week. I was wondering if this would work on a chicken also. Conrad – Yes, this will work on chicken, as well! Can we do this with a cooking bag also? Frances – I do not think this would be a good choice for the cooking bag method because the bag will keep your turkey moist without the mayo and the mayo will stay too soft in the bag. Does this eliminate the need to brine the turkey? Mel – You can use this technique with a brined or un-brined turkey. I wouldn’t say that it eliminates the need for it (if it is something you usually do), but it does not need to be done to use this method. So its not a good idea to use mayo if im using the bag to cook it in? Should i just cover it with foil?? The breast area of the turkey should be loosely covered with aluminum foil when you first put the turkey in the oven, then removed later when you need the bird to brown more. I hope that helps!